Canada Post's 'Sweet Canada' stamp set includes dishes from the West Coast to the Maritimes. Canada Post has produced several historically themed stamps in recent years on topics ranging from the anniversary of the First World War Armistice to Canadian hockey legends – but its latest lineup is pretty sweet. Starting next Wednesday, Canadians can add a dash of culinary history to the cards and letters they send. 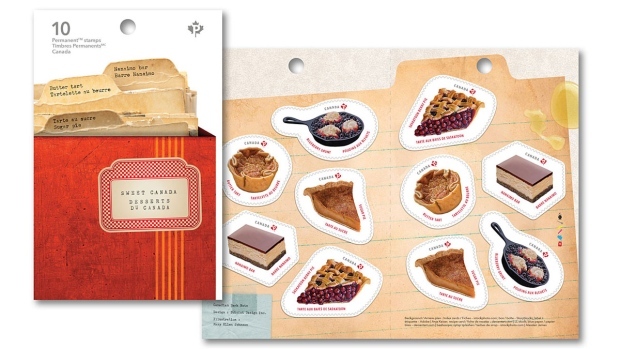 Canada Post's "Sweet Canada" set contains 10 domestic stamps arranged on a recipe card background. The differently-shaped stamps feature five Canadian desserts in what the post operator describes as "a tasty trip from coast to coast." Starting in B.C., the booklet includes two Nanaimo bar stamps. The recipe for the rich no-bake dessert is named after the city on Vancouver Island. 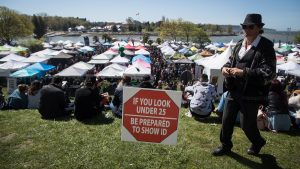 The treat originated in Nanaimo, but its exact history is unclear. "This creamy, chocolatey treat's origin is elusive, shrouded in mystery, and claimed by many as their own," the City of Nanaimo says in a post on its website, which includes a recipe for those who want to make the bars at home. Next on the journey through stamps is the Saskatoon berry pie, described by Canada Post as "a true Canadian original." The berries are high in fibre, antioxidants and proteins, and were once a staple of Indigenous people and settlers on the Prairies, Canada Post says. The next dessert is representative of Ontario, where many towns claim their bakers have perfected the recipe. "Butter tarts have become an object of cultural pride in some Canadian communities," Canada Post's website says. Heading east again, the next pair of stamps show Quebec's tarte au sucre, a sweet dish with European origins adopted by settlers in New France. The final stamps show the blueberry grunt, a dish made in the Maritimes from local blueberries and dumplings, and named after the noise it makes while cooking. The stamps will be issued on April 17, but anyone eager to order them in advance can do so online for $9. The products will be shipped once they become available next week.